Two notes from school, one of which is from the band teacher: it’s time to start picking out band instruments. Additionally, this is the most well-written letter we’ve ever gotten from one of their teachers, with no typos and excellent grammar. I find it sad that the band teacher is the one that writes the best letter. In fact, I find it sad that the letters we’ve gotten have been so bad that a good one is actually remarkable. A pile of replacement yo-yo strings. The $5 one of the boys earned this weekend picking up rocks in the fields. A pack of colored pencils. A tennis ball that Katie got for Christmas. She’s not much for balls, though, she prefers the stuffed creature that she pulls apart, spilling their fluffy guts allover the place. The mother’s day card the boys signed, but which still needs to be given to it’s recipient (not me…), and the pen they used to sign the card. Oh, and hey, there’s a quilt in that picture, too. The letters are just sitting on top, being contemplated. (*)No, I did not get to see the movie this weekend, but I really, really wanted to. 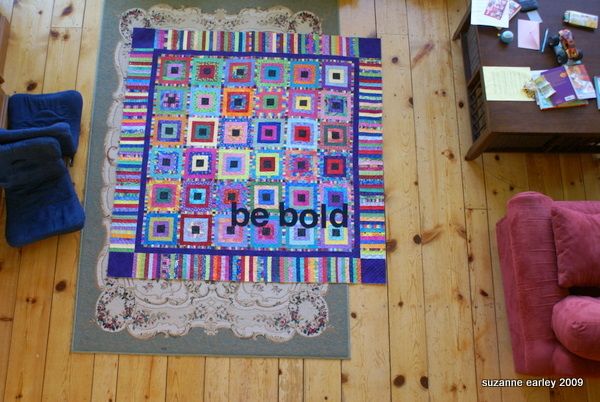 I love that bold, bold quilt!!! !